Reason being, when you introduce a seasoned auto body repairman (with experience in auto restoration) into the customized golf cart business, you never know what creations will turn out. J and B Motor Sales does golf cart conversions, miniature versions of popular roadsters, Jeeps, Hummers and NASCAR themes. "Your imagination is all that limits you when it comes to customizing a golf car." J and B Motor Sales turns out about three or four golf cart customizations a week. About 85 percent of those are electric vehicles (the quieter variety). In addition to their Michigan customers, J and B Motor Sales has customized golf carts in Arizona as well as in Florida. We Have a Big Hand in the Evolution of the Golf Cart. Maybe we should just stop trying to sound modest and call it The REVOLUTION of the Golf Cart. You might be surprised, but most of the golf carts customized and sold by us here at J and B Motor Sales of Metamora, Michigan never even touch a golf course. Not that there's anything wrong with golf. We just don't believe people need to limit themselves. Once golf carts are in our hands, they become something BETTER than regular golf carts: they evolve into one of our custom golf carts, that Darwin himself would be proud of! You see, when you introduce a seasoned auto body repairman - with experience in auto restoration, no less - into the customized golf cart business, you never know what creations will turn out. But you can safely bet they will turn out great. It all started over five years ago with just two used golf carts. No, we didn't build an ark, but we did build a terrific golf-cart business that we and our ever-growing following of satisfied and loyal customers can be proud of. J and B Motor Sales does golf cart conversions, miniature versions of popular roadsters, Jeeps, Hummers and NASCAR themes. "Your imagination is all that limits you when it comes to customizing a golf cart." Some of these you have to see to believe. J and B Motor Sales turns out about three or four golf cart customizations a week. About 85 percent of those are electric vehicles (the quieter variety). We Really Get Around. And You Can Too! 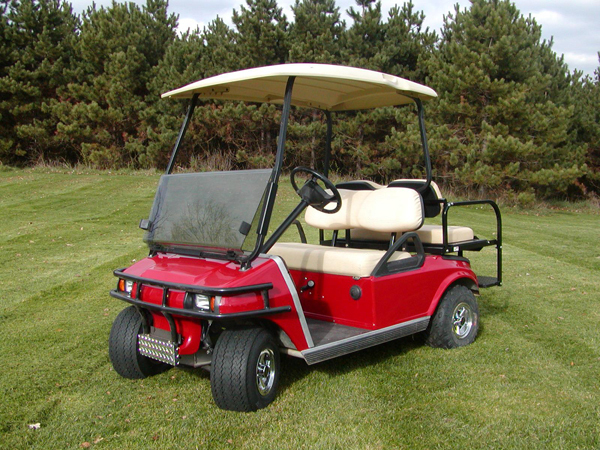 In addition to our Michigan customers, J and B Motor Sales has customized golf carts in Arizona as well as in Florida. Snow and mud tires also are available, as are four-wheel-drive golf carts. Also hand controls for handicapped use can be installed on certain models. Fender flares and fancy chrome and aluminum wheels are other options for your golf car. Special tires also come in handy for the golf carts J and B Motor Sales converts into heated snow plows and air-conditioned lawn mowers. Or you could be a recreational vehicle sales company, needing to show people around the grounds of your business and require a multi-passenger golf cart. New subdivisions and builders have moved into the golf car market, and use them to transport prospective customers from one housing model to another. You will find electric carts inside hospitals, factories and police departments. Gated communities and marinas also are frequent purchasers of golf carts. There are even places that call themselves golf-cart communities! Golf carts are a must for rallies and fairgrounds. People with long driveways use golf carts for hauling garbage cans to the road and picking up mail. Hunters have been seen in camouflaged golf carts. Golf carts are used on highways, to help workers clean up medians and road shoulders. People use golf carts as rough-terrain vehicles, or for gardening, hauling things to campgrounds, or as a mini utility vehicle for various yard chores. So don't be surprised if the next time you see a golf cart, you are nowhere near a golf course. And the golf cart you see may be your own!